Follow instructions to make 3 different robots per kit, then use your own creativity to make more. It takes imagination to look at a motley pile of familiar hardware—nuts, bolts, screws, and the like—and see a loveable robot. What's awesome about these three kits is that the creativity doesn't stop there. 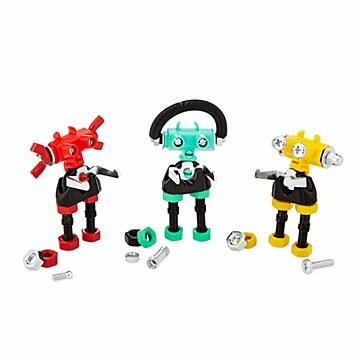 Each comes with detailed instructions for making three adorable robot characters from high-quality steel, non-toxic, painted parts. But that's just the jumping-off point. From there, the kits are designed to be used as springboards for your own homemade creations. Upcycle any old piece of unused hardware or spare parts to build a friendly little robot, bursting with geeky, goofy personality—a little bit like its maker? Made in Israel. My 5 yr old loved this! We put it together on Christmas. Kit with screws, nuts and little pieces. My 9 year old grandson loved it! My granddaughter loved this little gem, going to get all of them for her now!! Son puts it together and takes apart. Quick STEM project yes. Buy again no. to improve the product I would add a storage container for all the parts. Hours of fun for my little nephew! Robots were part of their Easter gifts.